(NASHVILLE, Tennessee) – Slanted Records' rock band DecembeRadio took home the Rock Album of the Year honors at last night's 40th Annual GMA DOVE Awards, which were aired LIVE on the Gospel Music Channel. 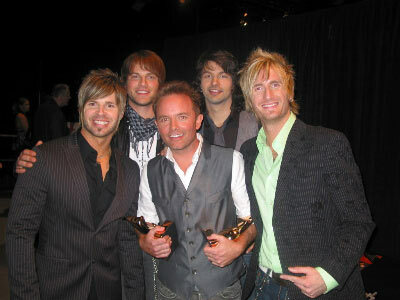 The band, which also received Rock Album of the Year honors for its self-titled debut in 2007, continued its run of successes with this year's win for their acclaimed sophomore release, Satisfied, produced by Scotty Wilbanks. DecembeRadio (Josh Reedy, Brian Bunn, Eric Miker, Boone Daughdrill and newly added keyboard player Josh Lovelace) received two other nominations for this year's awards including Rock Recorded Song of the Year (“Better Man”) and Rock/Contemporary Recorded Song of the Year (“Find You Waiting”). The band was on hand as presenters on this year's show, giving away the trophy for Female Vocalist of the Year as part of the telecast. Following the awards, the Virginia-based band rejoins the Newsboys tonight on the Join the Tribe tour, which has taken them to over 30 cities throughout the United States and into Canada. Their new single “Look for Me,” continues to gain momentum; and their new concept video for the single is airing nationwide. Satisfied is distributed by Word Entertainment/WEA with digital distribution by EMI CMG Distribution. For further information regarding the band and Satisfied, please visit www.slantedrecords.com/pr/decemberadio. And for more info on DecembeRadio, visit the JFH Artists Database.